What a delightful surprise — one of Weatherbury’s Folk Jam participants, Kevin Sell, brought these photos he shot of Weatherbury Farm on October 25 2009 to our May 2010 jam. Together they give a great overview of Weatherbury Farm. The Livery (where the suites for the farm vacation , 1992-2017, were located) is the topmost building on the left center of the photo. In the lowest level of the livery is the livery hall where workshops and jams are held. Cattle can be seen grazing above the Livery. 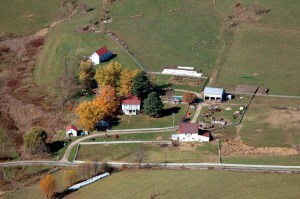 The Farmhouse is in the middle of the photo surrounded by white pines and fall foliage. 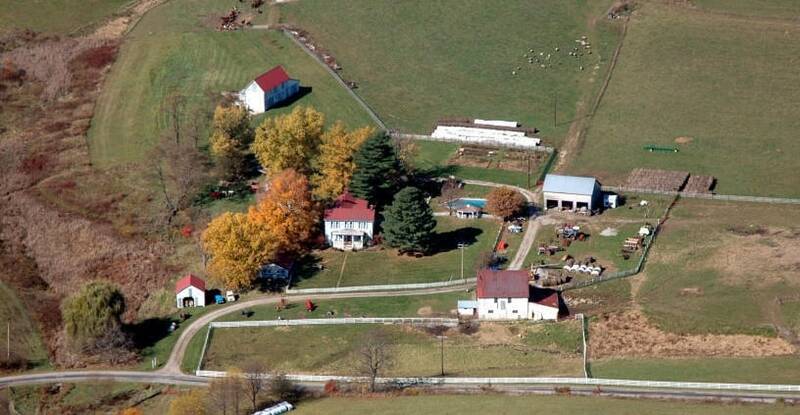 To the right of the farmhouse, above the gazebo, swimming pool and wrapped hay bales, sheep can be seen grazing. 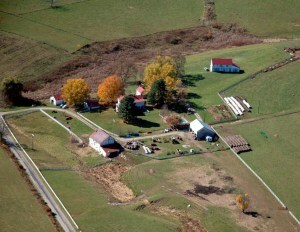 The barns are on the right — new barn on the top (sans doors, which are now in place) and the old barn at the bottom. The flour mill is located in the back of the new barn. In the foregrounds hay and crop fields are visible. These fields are used for rotational grazing in late fall. On the left hand side of the photo, is the rear of the Livery with its deck and patio. Snuggled between the trees, the Summer Kitchen, with its red roof and white clapboard walls is just visible in the center of the photo. Sheep are grazing above the livery. The fields above the fences in the upper right hand section of the photo are used for making hay in the spring & early summer and then for rotational grazing as the summer progresses. In this picture, you can see wrapped baleage and unwrapped dry hay bales. Since 2013, we have wrapped both our dry hay and baleage. (Read more about making hay) In 2018, we made 600 round bales of dry hay and baleage. The farmhouse is just visible beyond the white pine. The Summer Kitchen is to the right behind the farmhouse. The Livery is in the upper right of the photo. 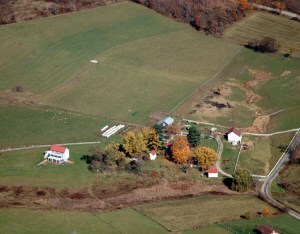 The brownish area above the trees and the area below the old barn are riparian buffers which protect the water ways of the farm. These are two of the four riparian buffers added to the farm. These areas are fenced out from the livestock and not mowed. Over time native trees, shrubs and flowers will re-grow in these areas. In addition to protecting the waterways, riparian buffers provide a habitat for wildlife.